So one of your company trucks that has served you so well for so many years, has finally given up the ghost – well, at least the engine has. But the truck body is in good condition and you’re not quite ready to retire her, so you start considering an engine rebuild. That’s right, keep the hot body and put a new heart in. Before you do, best ask yourself a few questions first. Here’s some help. If your truck or bus is as dead as the proverbial door nail, with the only sign of life in your engine being a spider’s nest, the likelihood of the engine resurrecting itself are about as probable as the zombie apocalypse happening tomorrow, or anytime for that matter. You might have no choice. No choice means that you either ditch the vehicle or rebuild the engine, which is actually a choice, but you get the point. Your zombie vehicle is going nowhere unless you do one or the other. What if the engine till runs but not so well? Making a decision on your engine when it’s already died is simple, making one while it’s still running is not so easy. However, if your engine is nearing the end of its lifespan, there will be symptoms, so keep an eye on your vehicle, pay attention to the below points and talk to the professionals before making your final decision. Smoking is bad for your health and it’s also bad for your truck’s. Smoke generally comes in three colours, each of which can mean something different. Check whether your smoke is white, black, or blue and talk to your mechanic. Does it sound like a hammer and spanner are having a boxing match inside your engine while the truck is running? Knocking noises are a sign you need a check-up, but might not necessarily signal the end of your engine. Once you’ve established that your engine is indeed finished, you need to decide whether you want a new truck or whether it’s worth it to rebuild your existing engine. This comes down to two factors, cost and value. What will it cost to rebuild your engine? Weigh this up against the cost of buying a new or second truck and compare. Knowing what it costs is one thing, but determining the value for yourself is another thing altogether, and ultimately will be the deciding factor. If your truck has some sort of sentimental value, it might be a classic, or it’s been around since you started your business, then the value of keeping it going for a few years is probably quite high and probably worth more to you than the cost of the rebuild. In that case, keep the truck and rebuild the engine. If on the other hand, you are not particularly attached to said vehicle, then practically speaking it makes more sense to replace it then fix it. There are a few basics. The mechanic will remove the lower half of the engine, the short block. It will be disassembled by experts, cleaned and assessed. 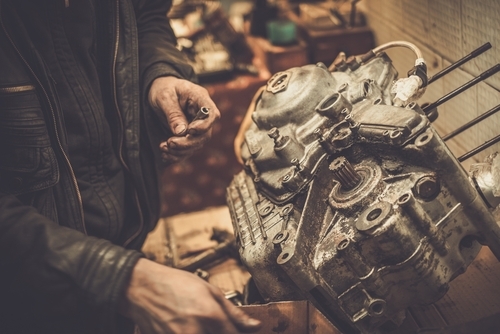 Faulty or broken parts will be replaced or cleaned, and essentially the entire engine will be reconditioned before being reassembled inside your vehicle. While you’re going about your engine rebuild, you might want to give your new engine that little bit extra. So why not soup up your engine, and deck out your truck at the same time, your drivers will thank you. Turbo charge: Adding turbo charge to your engine increases the amount of air that’s drawn into the combustion chamber, increasing the amount of fuel and ultimately the power of your engine. Add a new exhaust system, install high performance cylinder heads, and if applicable, install a new chip. So the performance is taken care of, now it’s time to work on its looks. Give your truck a cool paint job, a powerful new stereo, fix the air conditioning and your truck is good to strut its stuff for many years to come. If you’re still not sure, contact the professionals for the best advice and way forward for your vehicle. Copyright © 2018 Commercial Driveline.